In antiquity, Sappho was commonly regarded as one of the greatest lyric poets. The surviving proportion of the nine-volume corpus of poetry read in antiquity is small but still constitutes a poetic corpus of major importance. There is a single complete poem, Fragment 1, the Hymn to Aphrodite, quoted in its entirety as a model of the "polished and exuberant" style of composition by Dionysius of Halicarnassus, with admiration of its consummate artistry. 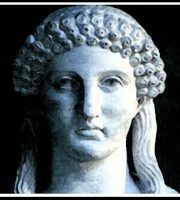 Here are some of her best poems translations in english and some of her famous poems and hymns to Aphrodite. The bulk of her poetry, which was well-known and greatly admired through much of antiquity, has been lost; however, her immense reputation has endured through surviving fragments. The only contemporary source for Sappho's life is her own poetry, and scholars are skeptical of reading it biographically. Later biographical accounts are also unreliable.